We've been meaning to post a small philosophical essay about the pros and cons of nowcasting, the practice of giving short-term updates on weather activity that's generally not considered forecasting. While that post will have to wait for another day, today's weather forecaster analysis wouldn't be complete without reviewing today's "nowcast" tweets of @JonathanYuhas. We're not trying to pick on Jonathan, but it sure seemed like everything he said turned out to be completely wrong. The following chronicles a night of forecasting-challenging weather juxtaposed with Jonathan's nowcasting tweets. We begin tracking Jonathan's tweets about 4:45 p.m. as the Twins game was moving into the later innings. While the quantification of a possible "25-minute rain" seemed overly precise, particularly since there was no guarantee the rain would even arrive, it was a nice little heads up, both for fans watching on TV and fans attending the game. About 15 minutes later, Jonathan issued his next tweet, delaying the possible arrival time of a 25-minute rain to 5:30. Next, Jonathan decided it would no longer be a stormy night, mentioning the possibility of only light showers. By approximately 8:45, Jonathan minimized the threat of rain even further, calling for the possibility of sprinkles at worst for the U2 concert-goers. He pronounced that the cooler airmass over the Twin Cities precluded the possibility of any severe storms. But just as Jonathan seemed to kiss any chance of significant rain goodbye, things started to change. Shortly after that, the radar began to blossom. Light green echoes turned to dark green, and then quickly to yellow, orange and red. Jonathan took note of the changing radar and alerted concert-goers about the possibility that some rain and thunder could "graze" the U2 concert. GUSTY WINDS OF 30 TO 40 MPH ORIGINATING FROM THIS STORM ARE LIKELY TO BE EXPERIENCED IN MINNEAPOLIS...ST. PAUL...AND LOCATIONS IN BETWEEN THE DOWNTOWNS...INCLUDING THE UNIVERSITY OF MINNESOTA. In fairness, other forecasters noted some of the same general trends, but their tweets weren't quite so precise or quite so wrong. We do think Jonathan deserves credit for actively tweeting in the first place, as it reflects his passion for what he does (and an understanding of the emerging importance of social media in weather communication). Still, tonight's events raise a few questions: Is nowcasting, particularly in a convective summer environment, really such a good thing? And is too much credence given to every turn of the radar, sometimes at the expense of seeing the big picture of possibilities? Looks like Yuhas had to many cocktails last night and went on a Tweet binge. Every now and again put the tweet away folks. Wow, tough night for Yuhas & I'm sure many other forecasters. There is no doubt that a cooler airmass settled-in over a good chunk of the metro yesterday evening, BUT I believe that was due to an outflow boundary and NOT a frontal passage. This likely burned a lot of forecasters. I was at the U2 concert. It was a deluge. Problem was, there was little 3G/4G access due to the amount of people trying to access the network from the stadium. I had no way to observe the radar trends! Weather is not an exact science and it's nearly impossible to predict correctly 100% of the time, which is why meteorology exists and also why we're all so fascinated by it. Nobody, regardless of level of expertise, should give a guarantee about a forecast, especially when the atmosphere is unstable, like it's been lately. At the same time though, I don't know if it's fair of us, the consumer, to demand instant updates and immediate access to information and then be upset when it's not perfect, especially when it's something that's unpredictable by nature. @nym0705, Jonathan Yuhas didn't leave Kare 11. He took a new position with the station that focuses on weather stories, storm chasing, and using social media to report and forecast. He'll be appearing on various newscasts sharing his stories, much like the reporters and photojournalists who create the Kare 11 Extras. 1) Given that the front had not yet passed, it seems the prudent thing would have been to say something like, "Looking good for the U2 concert, but until front passes, no guarantees." 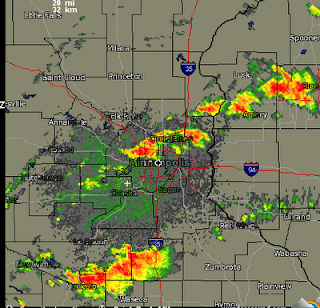 2) As I, Mr. Consumer, watched the radar during the Twins game, it didn't seem to me that the storms were headed for Target Field so I thought his mention of "could hit Target Field" was a little premature and somewhat of a stretch. And the mention of a 25-minute rain would only have seemed appropriate in the case of a steady, nonconvective rain steadily moving through the area, something that was not the case. 3) The Fox9 woman kept talking about waiting for things to pop when most others issued what seemed the all-clear. She deserves some credit. Jonathan's going to do reports on social media and weather reporting, eh? Based on last night's performance, ouch! Oh Ok I thought he was leaving, I am glad he got a good position and it should be interesting seeing his stories that he does. @Bill, I agree with everything you said. 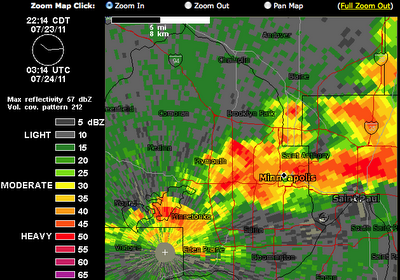 I can also attest to the fact that 15 minutes west of the Cities didn't see a drop of rain all afternoon or evening. My point is simply that "nowcasting," by nature, probably won't ever be very reliable (especially if you're looking for precision about timing, amount, etc). The meteorologists need to keep that in mind, as do the people turning to them for advice. ABOUT AN HOUR UNTIL 01Z BEHIND THE FRONT MOVING TO THE SOUTH"
So they missed it as well. Here is the surface map at 7pm last light..
looking from those maps and radar displays I'm really hard pressed to find the trigger for the metro development unless and this is a long shot, that lake superior had something to do with it. If you look at the surface maps at the reporting station around the Hinckley area it is the only reporting station showing a hour by hour drop of dew points and their winds were straight out of the wolfs mouth of Lake Superior. So may I ask the pros that stop in here from time to time to comment? PS: the boundary did not lift north, I was watching it on radar at the time and it got absorbed into the convection to our south. Randy, I believe the wind shift line that moved thru the Metro early in the evening was caused by outflow from late afternoon T'Storms. In other words, it was an outflow boundary and NOT an actual frontal passage. This was not interpreted correctly by many forecasters. The actual front was still just off to the north & west of the metro. Unfortunately for many of us, the front ignited right around 9pm over the metro. 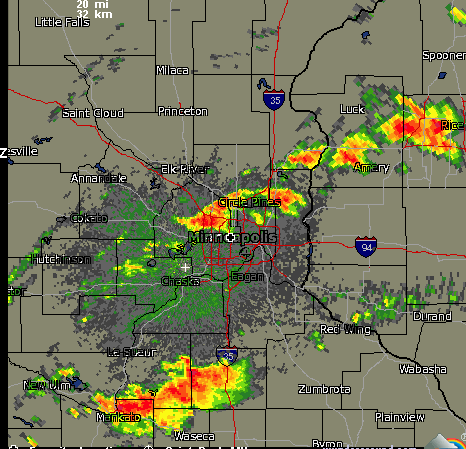 In fact, I believe if you zoom in on the radar screen capture above, you can see me sitting in the TCF Bank Stadium stands, with no rain gear, right under that red blob over Minneapolis.